The Leader of Fianna Fáil is the most senior politician within the Fianna Fáil political party in Ireland. Since 26 January 2011, the office has been held by Micheál Martin, following the resignation of Taoiseach Brian Cowen as leader of the party. Seán Francis Lemass was an Irish Fianna Fáil politician who served as Taoiseach and Leader of Fianna Fáil from 1959 to 1966. He also served as Tánaiste from 1957 to 1959, 1951 to 1954 and 1945 to 1948, Minister for Industry and Commerce from 1957 to 1959, 1951 to 1954, 1945 to 1949 and 1932 to 1939 and Minister for Supplies from 1939 to 1945. He served as a Teachta Dála (TD) from 1924 to 1969. Daniel O'Connell, often referred to as The Liberator or The Emancipator, was an Irish political leader in the first half of the 19th century. He campaigned for Catholic emancipation—including the right for Catholics to sit in the Westminster Parliament, denied for over 100 years—and repeal of the Acts of Union which combined Great Britain and Ireland. Dual player or dual star is a term used in Irish English to describe someone who competes in multiple sports - for example in Victorian Ireland cricket and hurling. The term today in Gaelic games typically describes a male player who plays both Gaelic football and hurling or, if a female player, a player of ladies' Gaelic football and camogie. The player does not necessarily have to play at the same standard in both sports. The number of dual stars at county level has decreased recently due to the increasing demands placed upon the best players of both sports. Gaelic games are sports played in Ireland under the auspices of the Gaelic Athletic Association (GAA). 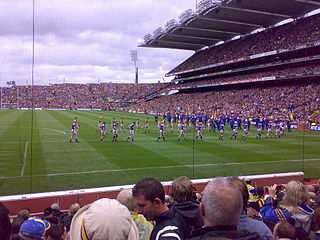 Gaelic football and hurling are the two main games. Other games organised by the GAA include Gaelic handball and rounders. Hurling is an outdoor team game of ancient Gaelic and Irish origin. It is administered by the Gaelic Athletic Association (GAA). The game has prehistoric origins, and has been played for 4,000 years. One of Ireland's native Gaelic games, it shares a number of features with Gaelic football, such as the field and goals, the number of players, and much terminology. There is a similar game for women called camogie. It shares a common Gaelic root with the sport of shinty, which is played predominantly in Scotland. The Munster GAA Hurling Senior Championship, known simply as the Munster Championship, is an annual inter-county hurling competition organised by the Munster Council of the Gaelic Athletic Association (GAA). It is the highest inter-county hurling competition in the province of Munster, and has been contested every year since the 1888 championship. The National Hurling League is an annual inter-county hurling competition featuring teams from Ireland and England. Founded in 1925 by the Gaelic Athletic Association, it operates on a system of promotion and relegation within the league system. Cork is a city in south-west Ireland, in the province of Munster, which had a population of 125,657 in 2016. University College Cork – National University of Ireland, Cork (UCC) is a constituent university of the National University of Ireland, and located in Cork. The Honorable Society of King's Inns is the institution which controls the entry of barristers-at-law into the justice system of Ireland. The full title retains the historical spelling variant "honorable" in preference to the contemporary Hiberno-English spelling of "honourable". In 1946 Lynch had his first involvement in politics when he was asked by his local Fianna Fáil cumann to stand for the Dáil in a by-election. He declined on this occasion, due to his lack of political experience, but indicated that he would be interested in standing in the next general election. In 1947 Lynch refused a similar offer to stand by the new political party Clann na Poblachta. A general election was eventually called for February 1948, Lynch topped the poll for the Cork Borough constituency and became a Fianna Fáil TD in the 13th Dáil. Although Fianna Fáil lost the election and were out of power for the first time in sixteen years, Lynch became speech writer and research assistant for the party leader, Éamon de Valera. Lynch's statement that the Irish Government could "no longer stand by" was interpreted by some Unionists in Northern Ireland as hinting at military intervention (and was misquoted as a promise not to "stand idly by"). A minority of ministers – two, according to Desmond O'Malley – would have favoured such a course, but the Irish Army was completely unprepared for an operation of this kind. The majority of the cabinet opposed military intervention, and Lynch took no such action, though he commissioned a study named Exercise Armageddon . As the violence continued, the Minister for External Affairs, Patrick Hillery, met the British Foreign Secretary and also went to the United Nations in a plea to send a peacekeeping force to the North and to highlight the Irish government's case. However, little else was achieved from these meetings other than media coverage of the activities in the north. The situation in Northern Ireland continued to deteriorate during Lynch's first term. Bloody Sunday (30 January 1972), saw the killing of 14 unarmed civilians by British paratroopers and a backlash of anti-British feeling in all parts of Ireland, including the burning of the British Embassy in Dublin. 1979 proved to be the year in which Lynch finally realised that his grip on power had slipped. The first direct elections to the European Parliament took place in June saw the electorate severely punish the ruling Fianna Fáil party. A five-month postal strike also led to deep anger amongst people all over the country. On 27 August 1979 the Provisional IRA assassinated Earl Mountbatten of Burma in County Sligo. On the same day the IRA killed 18 British soldiers at Warrenpoint in County Down. A radical security review and greater cross-border co-operation were discussed with the new British Prime Minister, Margaret Thatcher. These discussions led Síle de Valera, a backbench TD, to directly challenge the leadership in a speech at the Liam Lynch commemoration at Fermoy on 9 September. Although Lynch quickly tried to impose party discipline, attempting to discipline her for opposing party policy at a parliamentary party meeting held at 28 September, de Valera correctly pointed out that she had not opposed the party policy regarding the North which called for the declaration of the British intent to withdraw from the north. The result was embarrassing for Lynch. The visit of Pope John Paul II to Ireland in September proved to be a welcome break for Lynch from the day-to-day running of the country. In November, just before Lynch departed on a visit to the United States he decided that he would resign at the end of the year. This would allow him to complete his term as President of the European Community. The defining event which made up his mind was the news that Fianna Fáil had lost two by-elections in his native Cork (Cork City and Cork North-East, both on 7 November). In addition during the trip Lynch claimed in an interview with the Washington Post that a five-kilometre air corridor between the border was agreed upon during the meeting with Thatcher to enhance security co-operation   This was something highly unsavoury to many in Fianna Fáil. When Lynch returned he was confronted openly by Síle de Valera, Dr Bill Loughnane, a noted hardline Republican backbencher, along with Tom McEllistrim, a member of Haughey's gang of five, at a parliamentary party meeting. Lynch stated that the British did not have permission to overfly the border. Afterwards Loughnane went public with the details of the meeting and accused Lynch of deliberately misleading the party. An attempt to remove the whip from Loughnane failed. At this stage Lynch's position had become untenable, with supporters of Haughey caucusing opinion within the party. George Colley, the man whom Lynch saw as his successor, went to him and encouraged him to resign sooner. Colley was convinced that he had enough support to defeat the other likely candidate, Charles Haughey, and that Lynch should resign early to catch his opponents on the hop. Lynch agreed to this and resigned as leader of Fianna Fáil on 5 December 1979, assured that Colley had the votes necessary to win. However, Haughey and his supporters had been preparing for months to take over the leadership and Lynch's resignation came as no surprise. He narrowly defeated Colley in the leadership contest and succeeded Lynch as Taoiseach. Desmond Joseph O'Malley is an Irish former politician. Once prominent as a Fianna Fáil Teachta Dála (TD) and government minister in the 1970s and 1980s, he went on to found the Progressive Democrats and serve as the party's first leader from 1985 until 1993. He retired from politics at the 2002 general election. George Colley was an Irish Fianna Fáil politician who served as Tánaiste from 1977 to 1981, Minister for Energy from 1980 to 1981, Minister for Tourism and Transport from 1979 to 1980, Minister for the Public Service from 1977 to 1979, Minister for Finance from 1970 to 1973 and 1977 to 1979, Minister for the Gaeltacht from 1969 to 1973, Minister for Industry and Commerce from 1966 to 1970, Minister for Education from 1965 to 1966 and Parliamentary Secretary to the Minister for Lands from 1964 to 1965. He served as a Teachta Dála (TD) from 1961 to 1981. Neil Terence Columba Blaney was an Irish politician. He was first elected to Dáil Éireann in 1948 as a Fianna Fáil Teachta Dála (TD) representing Donegal East. Blaney served as Minister for Posts and Telegraphs (1957), Minister for Local Government (1957–1966) and Minister for Agriculture and Fisheries (1966–1970). He was Father of the Dáil from 1987 until his death. Kevin Boland was an Irish politician. He was first elected to Dáil Éireann in 1957 as a Teachta Dála (TD) for Fianna Fáil. He served as Minister for Defence (1957–1961), Minister for Social Welfare (1961–1965) and Minister for Local Government (1965–1970). He is one of six TDs appointed Minister on their first day in the Dáil. Brian Patrick Lenihan was an Irish Fianna Fáil politician who served as Tánaiste from 1987 to 1990, Minister for Defence from 1989 to 1990, Minister for Agriculture from March 1982 to December 1982, Minister for Fisheries from 1977 to 1979, Minister for Foreign Affairs from 1987 to 1989, 1979 to 1981 and January 1973 to March 1973, Minister for Transport and Power from 1969 to 1973, Minister for Education from 1968 to 1969, Minister for Justice from 1964 to 1969, Parliamentary Secretary to the Minister for Justice and Parliamentary Secretary to the Minister for Lands from 1961 to 1964. He served as a Teachta Dála (TD) from 1961 to 1973 and 1977 to 1995. He served as a Senator from 1957 to 1961 and 1973 to 1977. He also served as a Member of the European Parliament (MEP) for the Oireachtas from 1973 to 1977. James Gerard Collins is a former Irish Fianna Fáil politician who served as Minister for Foreign Affairs from 1989 to 1992 and December 1982 and March 1982, Minister for Justice from 1987 to 1989 and 1977 to 1991, Minister for Posts and Telegraphs from 1970 to 1973, Parliamentary Secretary to the Minister for Industry and Commerce and Parliamentary Secretary to the Minister for the Gaeltacht from 1969 to 1970. He was a Member of the European Parliament for the Munster constituency from 1994 to 2004. He served as a Teachta Dála for the Limerick West constituency from 1967 to 1997. Michael Eamon O'Kennedy is an Irish former Fianna Fáil politician who served as Minister for Labour from 1991 to 1992, Minister for Agriculture, Fisheries and Food from 1987 to 1991, European Commissioner for Personnel, Administration and the Statistics Office from 1981 to 1982, Minister for Finance and Minister for the Public Service from 1979 to 1980, Minister for Economic Planning and Development from 1979 to 1980, Minister for Foreign Affairs from 1977 to 1979, Minister for Transport and Power from January 1973 to March 1973, Minister without portfolio from 1972 to 1973, and Parliamentary Secretary to the Minister for Education from 1970 to 1973. He served as a Teachta Dála (TD) for the Tipperary North constituency from 1969 to 1981, 1982 to 1992 and 1997 to 2002. He was a Senator for the Cultural and Educational Panel from 1965 to 1969, and for the Administrative Panel from 1993 to 1997. Raymond MacSharry is a former Irish Fianna Fáil politician who served as Tánaiste from March 1982 to December 1982, European Commissioner for Agriculture and Rural Development from 1989 to 1993, Minister for the Public Service in 1987, Minister for Finance from March 1982 to December 1982 and 1987 to 1988, Minister for Agriculture from 1979 to 1981, Minister of State at the Department of the Public Service 1978 to 1979. He served as a Teachta Dála (TD) for the Sligo–Leitrim constituency from 1969 to 1988. He also served as Member of the European Parliament (MEP) from Ireland. James Brian Gibbons was an Irish Fianna Fáil politician who served as Minister for Agriculture from 1970 to 1973 and 1977 to 1979, Minister for Defence from 1969 to 1970 and Parliamentary Secretary to the Minister for Finance from 1965 to 1969. He served as a Teachta Dála (TD) for the Carlow–Kilkenny constituency from 1957 to 1981 and February 1982 to November 1982. Pádraig Eoin Faulkner was an Irish Fianna Fáil politician who served as Ceann Comhairle of Dáil Éireann from 1980 to 1981, Minister for Defence 1979 to 1980, Minister for Posts and Telegraphs and Minister for Tourism and Transport from 1977 to 1979, Minister for Education from 1969 to 1973, Minister for the Gaeltacht from 1968 to 1969 and Parliamentary Secretary to the Minister for the Gaeltacht from 1965 to 1968. He served as a Teachta Dála (TD) for the Louth constituency from 1957 to 1987. Patrick Smith was an Irish Fianna Fáil politician, who served as a Teachta Dála from 1923 until 1977; a tenure of 53 years, the longest in the state. He held a number of ministerial positions within the governments of Éamon de Valera and Seán Lemass. Eugene James Fitzgerald was an Irish Fianna Fáil politician who served as Minister for Finance from 1980 to 1981, Minister for the Public Service from 1980 to 1981 to March 1982 to December 1982, Minister for Labour from 1977 to 1980 and March 1982 to December 1982. He served as a Teachta Dála (TD) from 1972 to 1987. He was a Member of the European Parliament (MEP) for the Munster constituency from 1984 to 1994. Thomas "Tom" McEllistrim was an Irish Fianna Fáil politician. John Fahey was an Irish Fianna Fáil politician. He was a Teachta Dála (TD) for over twenty five years. The 1979 Fianna Fáil leadership election began in December 1979, when Jack Lynch resigned as party leader and Taoiseach. Lynch had been party leader for thirteen years and Taoiseach for over nine years. His successor was elected by the members of the Fianna Fáil parliamentary party on 7 December 1979. After one ballot the election was won by Charles Haughey. The 1966 Fianna Fáil leadership election in the Republic of Ireland began in October 1966 following the decision of Seán Lemass to resign as party leader and Taoiseach. Lemass had occupied both posts for over seven years and, while there was no pressure on him to resign, he felt that the time was right to hand over to a new generation. His successor was elected by the members of the Fianna Fáil parliamentary party on 9 November 1966. After one ballot the election was won by Jack Lynch. Fianna Fáil was founded on 23 March 1926 when a group of Dail deputies led by Éamon de Valera split from Sinn Féin. This happened because de Valera's motion calling for elected members be allowed to take their seats in the Dáil, if and when the controversial Oath of Allegiance was removed, failed to pass at the Sinn Féin Ard Fheis. The new party adopted its name on 2 April of the same year. From the formation of the first Fianna Fáil government on 9 March 1932 until the 2011 general election, the party was in power for 61 of 79 years. Its longest continuous period in office was 15 years and 11 months. Its single longest period out of office, in that time, has been four years and four months. Seven of the party's eight leaders have served as Taoiseach. It was the largest party in Dáil Éireann at every general election from the 1932 general election until the 2011 general election, when it suffered the worst defeat of a sitting government in the history of the Irish state. ↑ "Mr. Jack Lynch". Oireachtas Members Database. Retrieved 1 June 2009. ↑ Dwyer, T. Ryle (2005). Haughey's Forty Years of Controversy. Cork: Mercier. p. 240. ISBN 978-1-85635-426-4. ↑ "Jack Lynch". ElectionsIreland.org. Retrieved 1 June 2009. ↑ "A Chronology of the Conflict – 1968". Conflict Archive on the Internet (CAIN). Retrieved 11 July 2009. ↑ "FUTURE OF NORTHERN IRELAND (Hansard, 5 December 1972)". hansard.millbanksystems.com. Retrieved 2 November 2017. ↑ "The Taoiseach on the Situation in the North". RTÉ.ie. Retrieved 2013-12-27. ↑ ft01061990 (31 October 2009). "Jack Lynch On The Situation In North - 13 August 1969". YouTube . Retrieved 2 November 2017. ↑ Flora, Peter (2 November 1986). "Growth to Limits: The Western European Welfare States Since World War II". Walter de Gruyter. Retrieved 2 November 2017– via Google Books. Partial Reference: Cork GAA website Inter-County SHC Results and Teams. 1940-1949 Information from Peter Devine. Accessed 17 July 2010.